"His whole life a million-to-one shot". That was the original tagline for the 1976 film Rocky starring Sylvester Stallone as Rocky Balboa, a Philadelphia native who took part in boxing matches bot very often and wound up going 15 rounds with the Heavy Weight Champion. This is the story of the ultimate underdog. The story of Rocky is really the story of all of us. Rocky (Sylvester Stallone) was the guy everyone knew, in every corner of America someone knew a guy like Rocky. Always willing to dish out some child-like joke, even if it was at his expense. And yet while he was obviously a good natured sort of fellow, there was an air of sadness that surrounded him, for he was also the guy who never amounted to anything. In the film Rocky is a numbers runner for a local loan shark. It is the only sort of work someone like him can get, especially when he is also someone who spends his time in boxing rings getting his head knocked around. Fate intervenes in the form of Apollo Creed (Carl Weathers), he is the current Heavy Weight Champion of boxing and in the recent years his popularity with the fans has dwindled. Many think the fame and money have gone to his head, regardless his team comes up with the idea if having him go against an underdog in an exhibition match. It would be great press for Creed as well as whomever they pick and it would get him back in the good graces with his fans as well as the media. Sure enough they find young Rocky Balboa and after some convincing he agrees to take on Creed. Of course Rocky has no idea what he is getting himself into and has no real training regimen of his own. In steps the weathered and wizened Mickey Goldmill (Burgess Meredith) a boxing trainer who offers his services to Rocky. As Rocky begins his training with Mickey he also begins a romance with the sister of his best friend Paulie, Adrian. She is a shy and timid girl who has spent the majority of her life taking care of her older brother who works in a meat packing plant. As Rocky trains more and more each day he begins to wonder, "What if I went the full 15 rounds with Apollo?" Rocky knows he is the underdog here and even by going the full 15 rounds he also knows there won't be any reward coming his way, at least not in the form of money. But what Rocky starts to realize, with the help of his new love Adrian, is that he wants to be able to prove to the world and more importantly to himself that he is not just another pug from off the street, but someone who can go the distance. And so he trains as hard as he can until the day arrives when he steps into the ring with Apollo Creed. 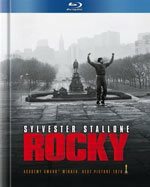 What made Rocky unique was not only the story of the underdog but also the extended fight scene at the end of the film. Instead of stepping into the ring with the two main actors, the camera stayed outside of the ring for the full fight, forcing the audience to feel as though they were truly one of the spectators in that arena. It was only after the fight was over and Rocky had shown the world that he was more than what they made him that we were finally brought into the ring and caught up in the joy of that moment, as a battered Rocky screamed out "Adrian!" After 35 years this film still holds water with audiences everywhere. There isn't a person alive who hasn't seen this film and experienced the passion it evokes. Now on a special edition Blu-ray disc it comes with an insightful retrospective on the film. Containing a heartwarming narrative by Richard Tanne, it looks into the early start of not only the film, but of Stallone himself and how he came to create one of America's most beloved movies. There are also interesting mini bios on each of the main actors detailing how they got started and what films they have been in. Lastly there is a full breakdown of the final fight between Rocky and Apollo. What makes so wonderful to watch is that it shows us that it doesn't matter where you come from and who you are, what matters is how you feel about yourself. At the end of the movie Rocky has not only found the love of his life, and won the adoration of people all over the nation, but he finally achieved something he wasn't even aware he was after: self-respect. Download Rocky Digibook from the iTunes Store in Digial HD. For more information about Rocky visit the FlickDirect Movie Database.